I live with the effects of my Traumatic Brain Injury and embrace the challenge everyday! I have a left sided weakness, and controlled epilepsy. 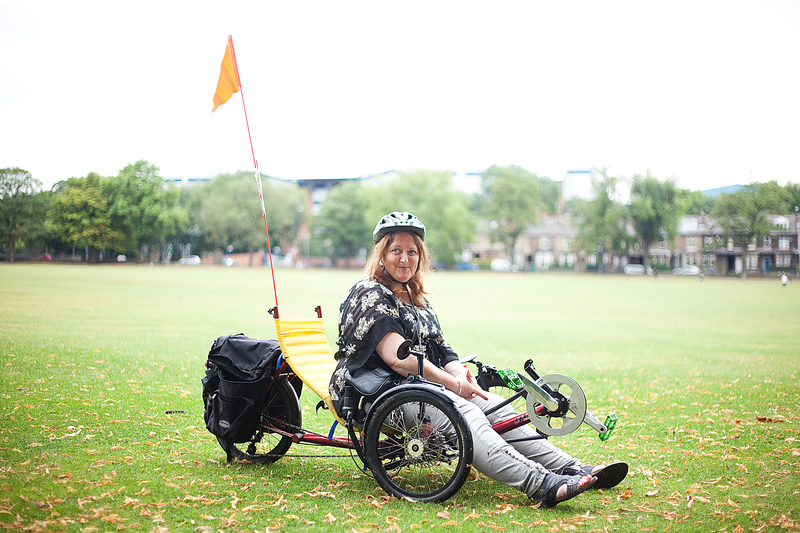 Personally speaking Inclusive Cycling has given me a love of life and provided me with an interest. And everything that comes with being able to TALK…a lot . To the huge network of interesting folk I’ve built up along the way. It’s a bit like the The Chicken and The Egg though, because I couldn’t have been so involved with Hillsborough Cycling for All, if it were not for the fantastic Nigel West, and the Wellbeing Consortium, but I wouldn’t have wanted too, If it wasn’t for my Hero Steve Marsden (Cycling Touring Club.) And then there’s Miriam, from Zest, at Upperthorpe. The support and the friendship and the trust, she has provided has been immense, she too has given me plenty to talk about at Dinner Parties, including Pride of Britain, and Buckingham Palace. I absolutely LOVE my work at Inclusive Cycling, mostly because of the superb team we have created in the past 2 years. There’s Nick, Dave, Fred and Myself. Between us, we just love to help folk Cycle, and will do our upmost to make it happen. There is no kind of higher Arky stuff, everyone just mucks, and if s’thing we can do will make someone happier. Then we just do it. I am so sad to say, although there are a few possibilities, I have no sponsor to ensure that my life at the Inclusive Cycling will continue. If you would like to sponsor me please feel free to get in touch through my blog! There are many other adventures, in my life, that I skim the surface of like, my work with the SDS Self Directed Support team, in Adult Social Care this is since I built up a bit of a reputation!! (not for that!!) I don’t think. And Brain Injury Research Rehabilitation Partnership. And more recently I have contributed to a fantastic book, written by brain injured folk like myself, sort of compiled by the fantastic Tutor and now friend Matt Colbeck. Well done Aimee, You put me to shame really …. When I’m not doing any of my Inspiring good things. I’m at home with my kids, probably witrh a Curry, and a bottle of wine!!! But I’ve heard nice things about you from Nigel West.